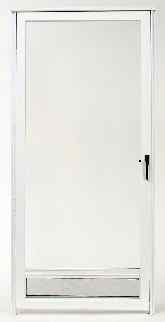 The Columbia Star 6100 Full-View storm door has a 1-1/4″ master frame, which is equipped with on non-removable piece of tempered glass. The bottom panel allows for interchangeable acrylic and screen inserts. Larger panel for improved ventilation. Available in natural aluminum and almond, black, bronze, sandstone or white baked on enamel finish.